If anyone out there struggles, or has ever struggled, with being enough in their ordinariness, you might relate to this little essay I wrote. Put simply, it’s about the kind of woman I thought that I should be – and one day – would be. After reading the first paragraph, you will likely become tired, then stressed, and hopefully by the end, amused by the insanity of it all. This simple exercise of articulating what my counselor calls an “idealized image” has helped me see how my lifetime of striving after an unattainable me, has kept me from living today and enjoying the imperfect, ordinary, hopelessly flawed, but adored, cherished, and completely lovable, me that God created to love and enjoy. If you can relate to what I’ve written, I invite you to write your own essay. Your true (flawed, ordinary, imperfect, but lovable) self will thank you! Each day I awaken before dawn to enjoy an hour of quiet Bible reading and intercession, the house all to myself at 5am. I make a real food breakfast feast, and get to work homeschooling. In between subjects, we go on nature walks on our neighborhood trails that back up to our 3.5 acres, picking wild berries and foraging other delectable foods. We picnic on a grassy patch, read a classic piece of literature that builds the vocabulary and brain synapses of my brilliant children who are sure to qualify for any Ivy or mini-Ivy, and possibly even by the age 16. No screen time for us when all we really need is Nature to satiate our curious minds. When we return to our homestead, we tend to our spirited hens and harvest fresh vegetables for that night’s dinner. But don’t forget the field trip! Today should it be the observatory for astronomy, colonial Williamsburg for their history lesson, or maybe just play time at the creek where the kids will entertain themselves for hours in the outdoors, skipping rocks, and asking myriad questions about creatures, cloud formations, and plant life? Bliss! Home for tea time – decompressing and savoring rich discussion alongside the children’s favorite loose tea, a real food version of scones, homemade lemon curd, and an assortment of homemade jams canned by yours truly from our berry bushes last Summer. Just another piece of the perfect childhood I’m busy creating for my children. After tea time, we prepare dinner together, being careful to use each measurement as a sensory opportunity for the youngest and math lesson for the oldest as he calculates fractions. Once dad is finished with work for the day, he joins in the cooking and learning, but also prepares the Bible lesson that he will be leading that night after dinner. All are ready to receive both spiritual and actual food around the table. Washed hands, garden-plucked flowers, and Mozart’s Requiem all set the stage for a feast for soul and body. Each receives joyfully and eagerly – full, overflowing, grateful. We are the perfect family. Aren’t I lovely? I am a passionate woman who is fiercely devoted to rearing her children with the best of everything – the best music, the best food, the best childhood experience. Did I also mention I blog about my life as a homeschooling, homesteading mom? I have 50,000 followers and am hoping to get a book deal. But did I also mention that I work as a realtor? That’s right, I am one of the leading realtors in the city, actually. I have only been in real estate for three years, but was honored and humbled to be included in the “top 1%” of realtors in my city. Sure, it’s hard for a homeschooling, homesteading mom to do both, but somehow I manage, without even compromising my health or sleep. It seems impossible, but I manage to get at least 8 hours of sleep each night, knowing it is a critical element of whole health- spirit, soul, and body. That, and of course, my daily hour spent walking or investing in my yoga practice. All of these things help keep me fit and lean, but also relaxed and clear-headed – two critical qualities of a homeschooling, homesteading, mom-blogging, taking-the-real-estate-world –by-storm woman. It goes without saying that as a Christian woman, I care deeply about keeping an orderly home, and am always open to welcoming others in and practicing hospitality. The state of the home is an outward reflection of the inner life, so I aim to keep mine pristine and tidy, and because I enjoy design, also furnished with fine, but livable, fabrics, art, and accouterments. Peace and comfort, with an understated elegance. My husband has nicknamed me “31” for short – his Proverbs 31 woman – it makes me blush, but I know it is true. He is satisfied in every way if you know what I mean, and can’t relate to the other men who complain of their wives being uninterested and closed off to intimacy. A love note on his bed each morning to greet him, surprise afternoon rendezvous, middle of the night adventures, weekends away together, and hot, wholesome meals prepared before he can profess hunger, are a reality – a given, really – as a Christian wife. Anything less would be withholding from my husband and a disappointment to me (and my standard) as “31.” It’s amazing the unity between us – finishing each other’s sentences, having the same dreams each night, and of course hours spent in prayer and intercession on each other’s behalf. You could say that we are what Paul had in mind when he discussed a husband and wife in Ephesians 5. A city on a hill. Some have wondered how I – as a homeschooling, homesteading, mom-blogging, taking-the-real-estate-world–by-storm, pristine housekeeping, daily-exercising, husband-pleasing woman – do it. It really cannot be explained in ordinary terms. You see, I actually am not ordinary. I am among the few super-people that God has created and what I can accomplish on any given day supersedes human capacity. It is wonderful to be truly extraordinary. A year has already gone by since we pulled out of our hometown of Austin, Texas, for the beautiful Blue Ridge Mountains of Charlottesville, Virginia, visiting every Whole Foods Market along the way of our 1200-mile minivan journey. Bear with me as I process this year – some emotions don’t yet have language, but I hope that this post will help me find the words. If I had to summarize the year in two words, it would be SPACE and REST. Yes, we left Austin in search of a slower paced life, a smaller city, and four seasons, but we also left because we needed SPACE – space to breathe, space to run free, and space to know in a deeper way our true selves – individually and as a family. The thrill of having literal space has not worn off, and we love every inch of our 3.6 acres. I still pinch myself as I drive up our gravelly driveway and see our “ugly brown house” (side story: a colleague said at a happy hour, “Oh, you bought the ugly brown house? Can you believe those sellers painted it BROWN?? ?”) perched on top of the hill. It’s our ugly brown house and we love it. Though I will be glad to paint it one day! In addition to actual space/acreage, we have savored the space we have in our schedules. We have deliberately chosen to ease into life here and not become pushed to the margin with activities and commitments. Jonathan works from home, and my work schedule is flexible. It has been a joy to see my husband thrive in his work and do the things that he was made to do – namely, to create and make things beautiful. He gets paid to use these gifts, and is part of a great company with excellent leadership. Though there are parts of the Tea Embassy storefront that we certainly miss, the relief we both feel is immeasurable. We have established a rhythm of life that ensures we have time to care for our bodies, our hearts, and our home, without feeling anxious and stressed. I hope we can maintain this rhythm of rest. In addition to space and rest, I cannot describe the impact that the beauty here has had on my soul and body. Driving home with the Blue Ridge Mountains in the backdrop is somehow repairing things in my heart and body that have needed to be repaired for a long time. I sleep here. Though my struggle with insomnia is not completely a distant memory, I am grateful that I have not had a sleepless night in over a year. There was a time when I did not think that would be possible. Beauty heals. And it heals in its own quiet, effortless way. I also love the rhythm and predictability of the seasons. In the winter, it is cold and everything looks dead. In the summer, it is hot and very lush. In the fall, there are leaves that change colors. In the spring, flowers suddenly appear and its as if a colorful paintbrush has suddenly stroked the entire landscape. This brings comfort and peace to me. I know it sounds silly, but the erratic weather of Texas made me feel crazy. I am happy to be in a place where I know what to expect (mostly). Of course life here isn’t perfect. As a relational being at heart, there are days when I miss my friends so deeply that my body actually aches and I have a perpetual lump in my throat. Sometimes you don’t know what you’ve got until it is gone. My Austin friendships took years to form, and you can’t replace that overnight. I am grateful for MOPS (Mothers of Pre-schoolers) here, where I have met so many like-minded, full-hearted, creative, beautiful, generous, fun-loving women, who though I may not know them yet, would come to my aid if my family or I needed it. I trust that in time, these relationships will bloom into friendships that are more like sisters than friends. Another thing I miss is being known. Despite the crazy growth in Austin over the past few years, it was still not uncommon to meet someone who would say, “I have known you since you were this big,” or “I played golf with your grandfather,” or “Your dad is my periodontist and he is the kindest, most caring man.” I miss that. I grieve having left a history of being a fourth generation Austinite to come to a totally new land where I have to start a new set of roots. I didn’t realize how much that would affect me. I wonder if Texasns are the only ones who feel this way because when I bring this up to non-Texans, they just kind of stare at me like I have two heads and wonder what the big deal is. It’s probably a Texas thing. The other thing is that I just kinda miss being among other Texans. When I think about raising our kids here, I am sad that I will not be raising Texans. More than ever, I have come to appreciate Texas and how anyone is allowed to be anything they want to be in Texas. Texas doesn’t care about whether your ancestors fought in the Revolution, what elite school you attended, or any of those other things that “qualify” a person. Texas just opens its arms and heart wide and welcomes you to be great if you want to be. Don’t get me wrong, Virginians are friendly, too, and I love how they value quality of life – commitment to farming, love of beauty, and celebration of the seasons and the unique joys associated with each. Still – you can’t really explain it unless you’ve lived it. Texas is Texas, and it’s unlike any other place. So given all that, I know the big question is: “Do you think you will stay in Virginia?” My answer is that – so far – I believe we will. Charlottesville is enchanting and I can’t think of a better place to raise our children. The Austin I once knew is no more, and I can’t think of anywhere else in Texas I would want to be. Besides, we have been blessed here. Doors of opportunity have opened for both us with our work, and we feel we are positioned for success as long as we stay consistent and continue to pursue excellence. Our neighbors are perhaps the biggest highlight and I can’t imagine finding that back in Austin, especially living on 3.6 acres! We love the schools our children attend and feel grateful to be a part of the communities at each place. I have several dear friendships here that in time will develop into those that I am currently longing for. It just takes time – a truth I always resist. Of course we don’t know what the future holds, but we do know that what is happening in and around us as a result of our move is good and needed, and that it has only just begun. Each day I learn a little bit more about what is actually in my heart and then have the (sometimes scary) task of walking it out. I have learned to speak up for myself, at times completely botching it, as I go from one side of the pendulum to the other. I have learned to rest, when the rational thing to do would be to strive to make something happen. And I have learned (am learning) to give thanks – in all circumstances – for abiding joy regardless of geography. Thank you, old friends and new, for loving us and cheering us on. So grateful we are not alone on this journey. Our Easter morning photo in front of our ugly brown house. 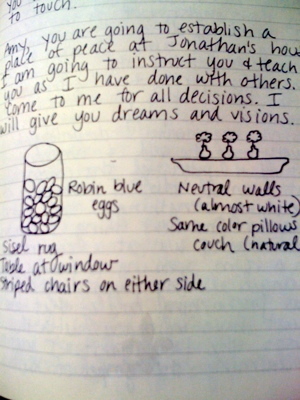 There are times when old journal entries stop me dead in my tracks. Prayers that once felt impossible are now answered. Longings that were once so deep that my body actually ached are now fulfilled. I see how God was faithful then, and I can trust that He will be faithful now. It is my food in the waiting. Before I did dream boards, I would occasionally come across something that inspired me so much that I would paste it into my journal. It was usually something that I was waiting for and my heart needed the visual reminder to keep praying and keep believing during the waiting. In September 2009, I was barely pregnant with our second child, and came across a picture of a precious little girl in the Pottery Barn Kids catalog. She had a bag next to her with the name “Abby” on it – the name I had always loved for a girl. Something about this little girl struck me. I was taken by her – her loose, soft curls, blueish-green eyes, button nose, and peaceful countenance. I glued the picture in my journal and dared to ask God again for my own Abby, a prayer I had been praying for almost a decade (well before I was married! ), which at one point felt impossible since the doctor said that children might not be possible given the things going wrong with my body at the time. Just a few months after posting that picture in my journal we found out that we would, in fact, have a girl. Our Abby. Beautiful, free-spirited, artistic, worshipful, friend-of-God, Abby. P.S. In case my other kids read this one day, we prayed for you too! Each of you is a miracle and has a marvelous story only God could write! Two years ago, at the urging of my wonderful husband, I made one of the best decisions and chose to invest in myself by attending The Destiny Project – a life-changing course led by Sarah Sherwood that helps you identify your true identity and life mission. 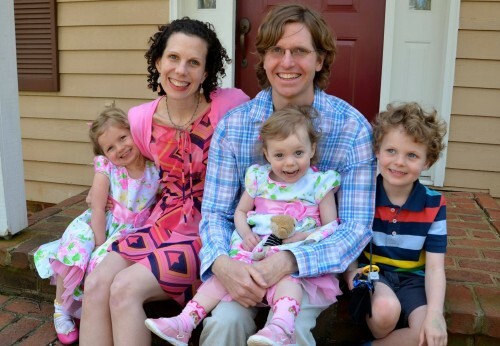 At the time, I was struggling with some PPD as a result of caring for my third child, Hallie, who cried the first several months of her life. Without stopping. If she was awake, she was crying. And most of the time she should have been sleeping (and we should have been sleeping), she was crying. There were many times I had to step outside my house so that I would not harm her. I wish I were kidding. It was scary and horrible. We were also under financial duress with a business that was growing, but not at the pace of our family. That December it became obvious that I needed to seek help. Though my mid-wife recommended that I see a psychologist who specializes in PPD, the thought of spending my “time off” in an office talking about how sad I was that my baby cried all the time sounded even more depressing. I sensed that I needed something that would go deeper. Something that would speak to my innermost being. Something that would blow on my barely flickering spirit and fan hope, purpose, and vision into flame. We took money we didn’t have and put it towards my 8-week adventure with The Destiny Project. Little did we know that this little investment would turn our family upside down in all the right ways. 3. Create your board on poster board/a large piece of sturdy paper. Make it as big as you want if you have lots to put on there! Make it obnoxiously big if you need. Again, don’t judge yourself. 4. Hang it up in a place you see everyday. Ours hang in plain view at our breakfast/dinner table. It looks kinda tacky, but it’s worth it to be in touch with your heart every day. You become what you behold. I know that doesn’t seem that life-changing. But here’s the thing. I did mine and there were several very clear themes that emerged, making it clear what my heart was saying at the time. For one thing, there were about 50 pictures of me SITTING DOWN by a beach, lake, or other body of water, and even a few pictures of actual beds. I WAS TIRED and my heart was trying to communicate with me since I was obviously ignoring my body and my mind. It wasn’t just about needing sleep. It showed me that I deeply value REST. And I love for others to enter into a place of rest as well. It is actually one of our family’s values. Another value that emerged for me was ACHIEVEMENT. It became clear that something was missing in my life at that point. It was something that I had judged so harshly in myself (and in others, if I am honest), and that was – the need/desire/longing to accomplish things – outside of the home. I had tried to be the perfect pour-everything-you-have-into-your-children-and-home kind of woman, but at the end of the day, I really missed connecting in the marketplace. It was like a well of life and creativity was stopped up and contributing to the sadness I felt in my heart. I admit, I felt like I was less of a woman or mother for having that desire. It was such a relief to give myself permission to sit with this value of mine, and instead of judging it, to nurture it and consider ways to engage it. Just taking the judgment away brought so much peace and hope! Many of the other images on my board did not make sense at the time and would take a year or more to begin to manifest (new ager term!). I was hooked though. I suddenly felt like I was a part of life. I felt like I had choices and could live the life my heart wanted to live. Because my husband is an INFP also, he’s all about these kind of touchy feely exercises and readily created his own dream board. 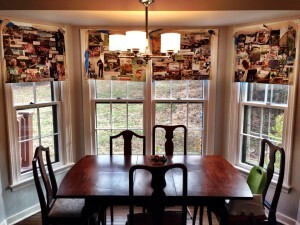 We posted them on the wall by our breakfast/dinner table and discussed our boards every day. At breakfast every morning we asked each other, “What do you see today on your dream board?” Pretty soon these images, words, and phrases weren’t just something we were discussing. They began to take root and we began to live them out. I can’t explain it. I just know that at some point I really believed what I was seeing was possible, and that it was going to happen and that was that. When the first dream boards felt stale, we made new ones. And we continued to ask each other every day, “What do you see on your dream board today?” And our kids asked, too. And Preston even made his own dream board (full of Legos). We encouraged him to put whatever he wanted on it. Just get in the habit of knowing what is in your heart and putting it out there to see – without judgment. Little did we know that those dream boards would lead my hubby not only to a career change, but to a whole new life half-way across the country! Though much on our second dream boards is still “in process” and hasn’t fully “manifested,” it feels like it’s time for the third. And I can’t wait! I love seeing what there is to pursue, discover, choose, and become. You never know what will emerge…though I hope it does not involve any drastic changes anytime soon! This simple exercise was an instrumental part of my turn-around from depression and hopelessness. It began a new journey of greater self-discovery, self-compassion, and endless possibilities that has been more life-giving than the countless groups I have been a part of in the past. It was what my husband and I held on to when none of our circumstances made sense. We believed that what we could see on those boards was possible and that it was worth clinging to and fighting for. Who knew? Magazines + scissors + tape + an open heart + courage = ENDLESS POSSIBILITIES and LOTS OF HOPE. Disclaimer: Just because I chose to go this route rather than the counseling route does NOT mean that it is right for everyone. Sometimes professional help is critical. This was what was right for ME after my husband and I spent time talking through and praying about the options. Be led forth with peace and joy if you find yourself in a similar situation. It seems only fitting that my first “real” post of this blog would be written in honor of you – my dearest friend, most faithful companion, most dedicated caretaker, most ardent encourager, and most committed father of our children. When most people get married they likely have a couple of blissful months, and then realize after a while that who they married isn’t really who they thought were. The masks come off and the true colors are revealed. You, however, have been the complete opposite. The longer we have been married, the more I realize that you are better than I could have ever imagined. Who others may know you to be or think you to be doesn’t hold a candle to who you really are. Behind closed doors when no one is looking, in the waking, should-be-sleeping, unglamorous routines of the day-to-day, you show up – every day – with kindness, gentleness, and quiet strength for others to lean into. I have spent these past six plus years as the grateful recipient of your seemingly endless patience, steadfast, abiding love, and selfless commitment, and have been changed by the atmosphere of grace and peace that you provide. Something that others may not know is how you have spent the past year as my caretaker. When my health tanked last year from insomnia and the residue of PTSD, and my mind struggled to remember much of anything – including how to get from point A to point B in our own hometown, we did not know how we would survive. I couldn’t sleep at night, which meant I could barely function during the day, either because of exhaustion or because migraines consistently took me out. I would lie awake, frustrated, desperate, and guilt-ridden, knowing I was keeping you from sleep, too. You never hesitated. Every miserable night you came to my rescue, praying for me and asking God to have mercy and grant me rest. I struggled because not only was I not “contributing” to the family, I was being a drain – which was in my mind, the worst possible thing I could be. Instead of shame and frustration you showed me compassion and patience, and assured me that I was worthy of love whether or not I contributed anything. When the doctor said we were going to need a radical change of life in order to shift my body and mind’s “fight or flight” loop, we did not know what to do and our options seemed few. There wasn’t enough money to hire help, and we couldn’t impose on our families to meet our needs, considering our complex healing diet and Hallie’s special needs. After we weighed everything, you announced that you would take on the responsibilities of the home, run the tea business remotely, and care for me and our three babies, including all of the cooking, cleaning, and night time wakings with the baby. And you did. And I rested. And I started to heal, and even started to thrive. You were Jesus-with-skin-on to me every day, putting your needs and wants last (every. single. day), in order to nourish me, restore me back to health, and bring me into a new understanding of my worth. It still brings me to my knees. Such love. Such incredible faith expressed through deeds. Such strength. Truly walking the walk, in the footsteps of Christ, who laid it all down for undeserving recipients. So this 37th year of your life, my prayer is that you will reap the goodness, lavish generosity, kindness, patience, and love that you have sown into others. My prayer is that you will be seen for the man that you truly are, and that you will enjoy great favor whatever you put your hands to. My prayer is that you will enjoy your friendships – old and new – and that you will know their support and loyalty. My prayer is that you will feel alive in your vocational pursuits, and that you will discover deeper wells of ingenuity and creativity than you ever imagined. My prayer is that you will live from a place of rest, and that your spirit, soul, and body would come into greater wholeness and health than ever before. It is true that the measure of a man is not in strength, riches, or knowledge, but in how much he loves and is loved. Know that you are loved with everything in me, and that I am eternally grateful that you chose me to walk next to you. Happy birthday, Jonathan, my gift of God. #36. Farm fresh eggs from Wendy, the mail carrier. You’ve never seen more glorious, bright orange yolks. #37. Orthodox Jewish man at the park with his 8th child. #38. Watching the faithful Jews in our neighborhood walk to synagogue. Families walking arm in arm at sundown to worship. #39. Valentine’s breakfast made with love by my beloved husband. Heart-shaped eggs for me, and heart-shaped toast for the little guy, served up on a bright pink plate. #40. Pink skies on a walk at dusk. #41. Finding the perfect gift for a friend who just needs to know that God sees. Truly, it is better to give than to receive. #42. Our business that feels more like a family than a business. So grateful to be a part of bringing peace, joy, and healing to people in our city. May His presence fill our business and may every one who enters experience His unfailing love! May the tea bring healing to all – spirit, soul, and body! #43. Fresh veggies from our neighborhood CSA. I love having a box of wholesome goodness from a real farm, picked by real farmers, delivered to me each week! #44. That all things really do work together for my good. How would I live if I really believed this was true? Goodbye fear. Goodbye, shame. Hello, perfect love. #45. New eyes. His eyes. Eyes that see as He sees. Goodness all around me, all the time. His constant pursuit to remind me that it is enough for me to be simply beloved. I love this message by Graham Cooke. It’s that time, though I can hardly believe it. Seems like yesterday I gave birth to our little joy-ball in the bathtub at the Austin Area Birthing Center. In reality, it was over fifteen months ago! Time flies, and alas, we are ready to get started with Baby #2. I had a near perfect pregnancy the first time, and while most of that was simply grace (thank You, God! ), I do believe that my diet and habits played a significant part. Many women interested in having a natural (drug-free) childbirth have since then asked me what I did for my “perfect pregnancy.” So I thought I would give some simple steps to help you so that you can provide the best possible physical environment (I’ll cover the spirit and soul/mind in later posts) for your baby to develop. These are a great refresher for me too as I get this body ready! 1. Begin eating a diet based on whole, real foods. If you do only one thing, stop eating “foods” with chemicals. Look for these ingredients specifically and eliminate them completely from your diet: high fructose corn syrup, anything “hydrogenated,” Nutrasweet (that means no Diet Coke, ladies), pretty much anything you can’t pronounce. Remember, simple is better, and God made our food with everything we need in it. If He didn’t put it there in the first place, we probably don’t need it. I wholeheartedly recommend Real Food for Mother and Baby: The Fertility Diet, Eating for Two, and Baby’s First Foods . This book was written by a real mom and has a real easy-to-read style. If you buy only one book for your pregnancy, make it this one! Note: If you have been eating a diet full of chemicals and processed foods, would you consider doing a de-tox or “cleanse” before you get pregnant? My favorite cleanse has been the Standard Process 21-day cleanse. It is whole foods based, organic, and completely natural. It is also one of the more balanced cleanses, and has had long-term results for me. It will help you find your ideal weight and will break your food addictions. 2. Water, water, drink more water. Get in the habit now. My beloved husband must have brought me a glass of water every 20 minutes when I was pregnant. Part of what kept my weight down was the fact that I was running to the bathroom every five minutes! This is not necessarily something you will want to do. Do it anyway. 3. Walk! It’s one of the few exercises you can do the entire pregnancy. We walked almost everyday of my pregnancy, literally. During the first few weeks, I ran into a woman who had delivered both of her boys without drugs. She said the first birth was much easier than the second because she had prepared by walking all the time. I took her words as if they were from God Himself and I made it my goal to walk all the time. Since I was determined to have a drug-free birth, I basically pretended that I was training for a marathon and kept a painfully regimented schedule. It really helps if you have a partner to do this with – like your husband! 4. Stretch! Boy, do I need to be writing this. I have not been diligent about stretching post-partum, but that is about to change. We had a few sets of exercises that we (I) did each night to help me maintain flexibility. I was determined not to swell and knew that I needed to keep good circulation. It worked! Stretching. Key. You could also do prenatal yoga. I kept it simple and just bought a video rather than going to classes. If you are like me and only want to buy one video, I’d go with this one: Prenatal Yoga . Once I had watched it a few times I just did the exercises that I liked the best so that I didn’t have to sit through too much mumbo jumbo. No offense. 5. Take prenatal vitamins. I am passionate about my prenatals. If you are a skeptic and think all brands are the same, trust me, they are not! You want a whole food-based vitamin (that means you are eating actual foods, not synthetic garbage! ), preferably organic. Again, I wholeheartedly recommend Perfect Prenatal . Go ahead and buy the big one. You’ll be pregnant a while and you’ll still want to take them when you’re nursing all the time. 6. Rest, relax, and get in the habit of taking naps. You need lots of sleep. My beloved husband stroked my arm until I fell asleep every night since it was sometimes hard for me to get relaxed. This was great practice for labor since relaxation can help the labor process go much more smoothly. Watching a movie was also like taking a sleeping pill. Whatever works for you, get some sleep. This list is by no means exhaustive, but I am sure you already have a stack of books to tell you everything else. The point was to keep it simple. It’s not all about the body either, so stay tuned for future posts about getting your mind and spirit ready for a perfect pregnancy, labor and delivery, and baby! 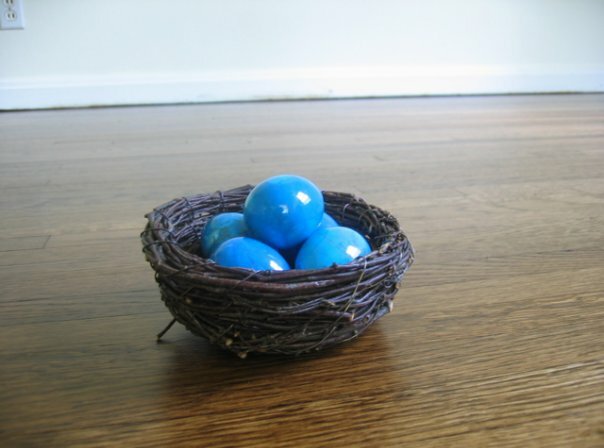 Exhilarated, I ran to my beloved and told him what we had to look forward to on our honeymoon – a blue egg hunt – led by our wild Heavenly Father who happens to take great joy in decorating. My beloved was as thrilled as I was. An adventure to come! The magical wedding day came and went, and our first honeymoon began. Jackson Hole. We took in the bright blue skies, the purple mountains’ splendor, and the sparkling lakes, but there was not a bright blue stone egg in sight. 5 days later, we left Jackson Hole without blue eggs, and the hope that honeymoon #2 would bring the promised gift. Five. Why not seven? He brought five. The number of grace and favor. There may be many reasons, but the one I like the best is that those five eggs remind me that it is all His grace. His grace put the vision of those eggs in my imagination, His grace gave me the faith to believe that He “could bring something out of nothing,” His grace took us on an amazing trip where we could search for those eggs, His grace ordered our steps that led us to those exact booths to find those exact blue eggs, His grace gave us the money to pay for those blue eggs, and His grace brought them safely to our beautiful home where they sit as the centerpiece in our living room where life happens daily. And favor. During that time, I really believed that God favored me enough to tell me exactly how to decorate my house, and then provide all the details. Disappointments, discouragement, and busyness seem to have diminished that childlike faith during these past several months. Was that just a season that ended? Or, is He still willing? Oh, I hear Him say that He “is more than willing.” Does He really speak that way? Oh yes, and so much more. He is wild, extravagant, and lavish. He does more than we can ask for or imagine. More than. These blue eggs are just the beginning. If only I will seek. If only I will ask. If only I will believe. This blog will soon delight you with words to share from God’s heart.